So, I was browsing the interweb the other day, looking for nothing in particular. I think I was probably searching for art ideas. Do you ever do that? For me, it's a horrendous waste of time, and while I know it's true, I can never help but get carried away regardless. If you were to search through the "My Pictures" file of our Window XP computer, you would find, top-left, a folder called 2009-08-07. Original, right? Take it a step farther and click on that folder, and you would find several folders within that folder. (Folder-ception, if you will.) These various folders contain everything I would love to draw but don't have the patience for. Folders with names like "Art Ideas", "Textures", "Dream House", "To Draw", "Cosplay Project", et cetera. Within these digital-walls are a plethora of ideas of anything under the sun that could inspire a person to draw. But do I draw them? No. I dream of drawing them, though. ...And part of the dreaming process includes google-searching more stuff I'd love to draw. 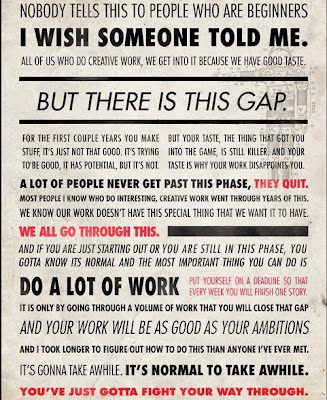 I was doing just that, looking for more stuff to "inspire me", when I came across this poster. 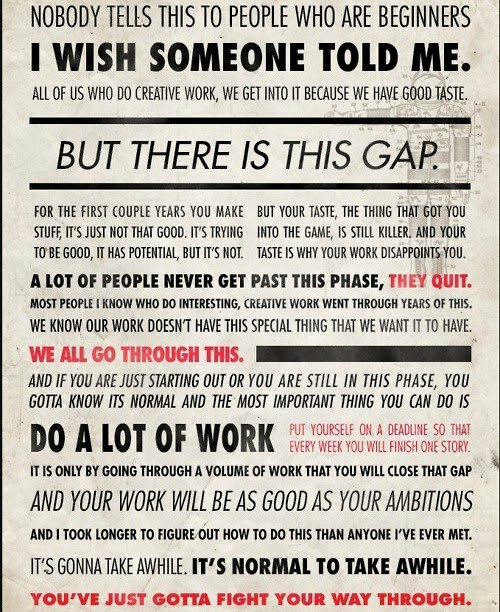 Kinda plain looking, but worth the read, seriously. For any of you who do creative things like drawing, playing an instrument, writing or taking pictures, I give to you this article. Maybe you'll find it to be somewhat encouraging.